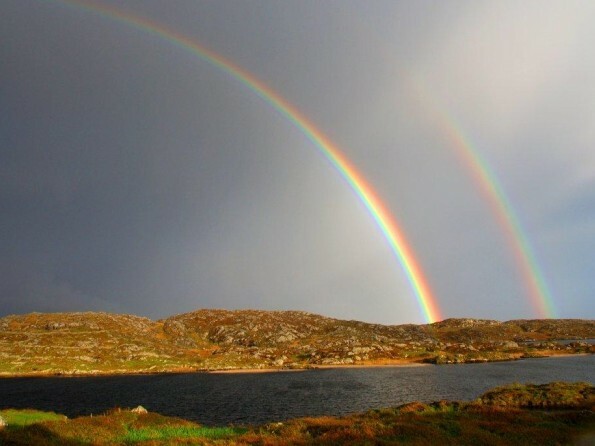 Situated in a remote location in beautiful unspoilt Connemara, on the far western edge of the Atlantic Coast of Ireland, is Carries Cottage, a traditional stone cottage holiday home on the shores of a lake, close to the sea and sandy beaches and with magnificent mountain views. 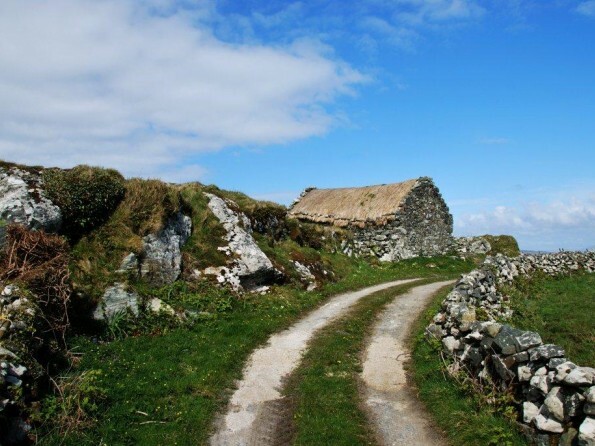 Carries Cottage is a traditional Irish stone cottage, parts of which are believed to date back several centuries. The location is remote and secluded, the lakeside setting is serene and tranquil, and the rugged mountain scenery is a breath-taking backdrop. Just 5 minutes walk from a series of sandy beaches this is the perfect place to really get away from the noise, stress and pollution of your normal busy life and retreat to a place where you can breathe fresh air and enjoy being surrounded by natural beauty. The views are nothing short of magical. 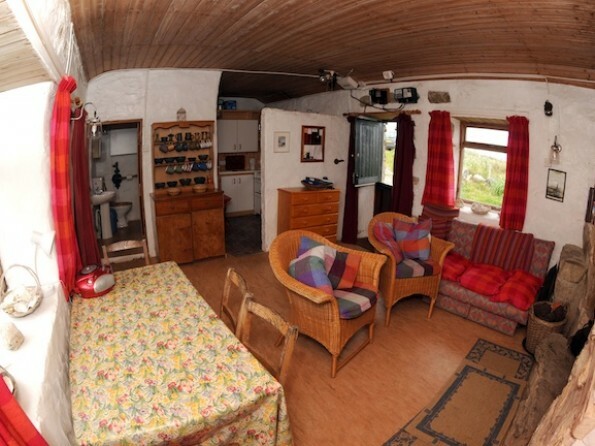 The cottage is an ideal base from which to explore Connemara. 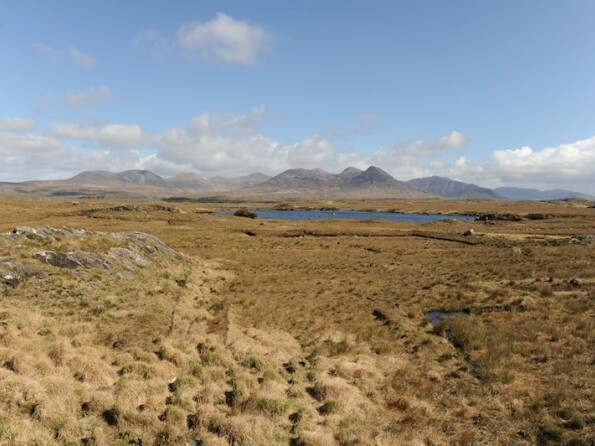 The nearby Twelve Bens mountains are renowned as an excellent area for hill climbing, and the area around the cottage is a haven for many kinds of wildlife, with hares, swans, cormorants and other seabirds being frequent visitors. 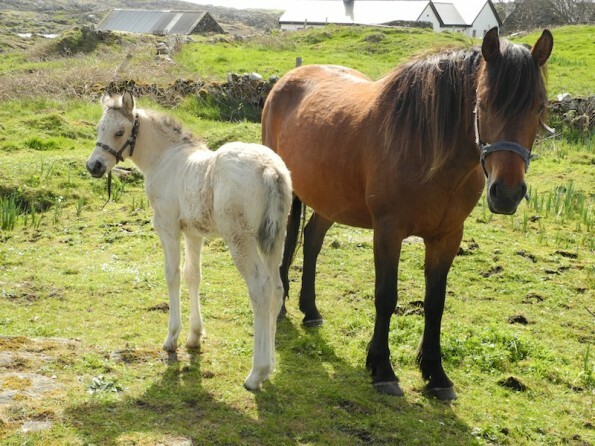 The nearby town of Clifden (approximately 12 miles away) has a good variety of shops, bars and restaurants, as well as a laundry, a bank, a tourist office, a doctors' surgery and many outlets selling local produce. The cottage, which is all on one floor, is divided into a sitting room area, a porch, a kitchen, a bathroom and two bedrooms. 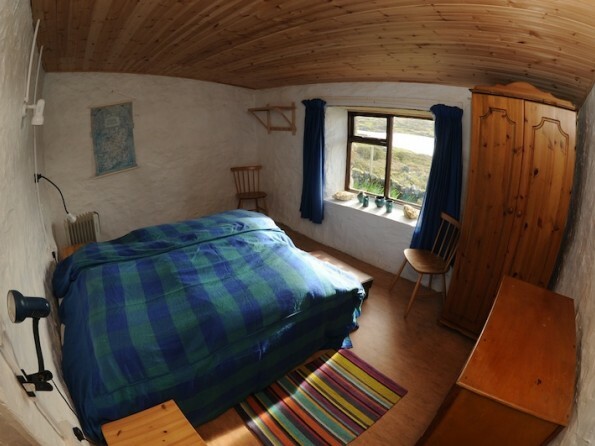 Bedroom one is a large twin bedded room with a chest of drawers, a wardrobe, a heater and a window which faces towards the Twelve Bens mountains. Bedroom two is a lovely southeast-facing room with twin beds, two chests of drawers, a wardrobe and a heater. This room has dramatic views over the nearby lake and benefits from the early morning sun. The kitchen is equipped with a fridge, a microwave, a toaster and a range of cooking utensils, as well as an electric oven with grill. The bathroom has a wash basin, a low level WC, a full size bath and shower and a wall-mounted electric heater. The cottage has a superb open fire where traditional peat logs, available locally, can be used. 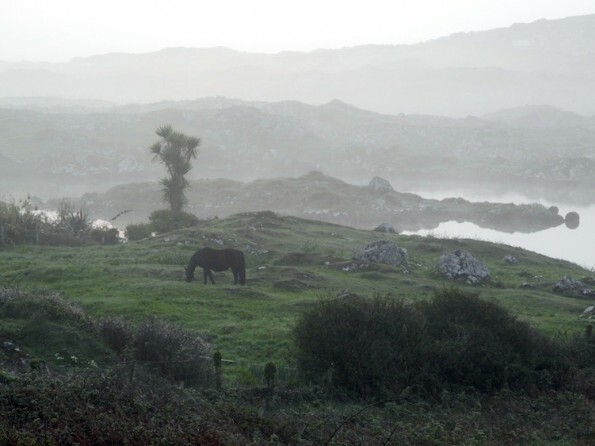 The cottage nestles into the hillside next to a large, peaceful lake and is surrounded by the rolling, rugged Connemara landscape. Outdoor chairs and tables are provided - don't be surprised if local cows come visiting. The first of three sandy beaches is just 5 minutes from your doorstep, the third beach is good for surfing. 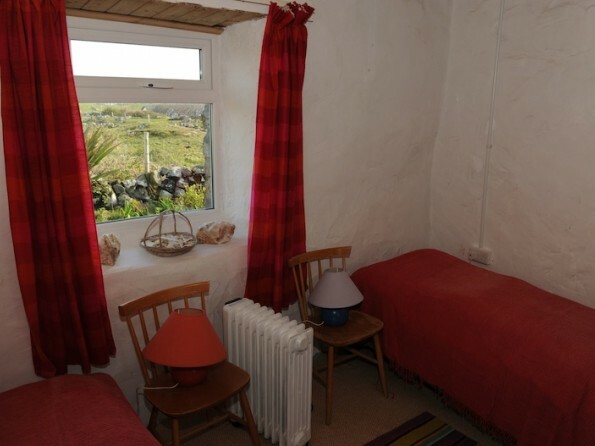 Carries Cottage is normally available to rent from Easter to October each year. Hot water is provided by electric immersion heater and electricity is supplied by a meter which takes 2 euro coins. Bed linen is provided, but you will need to bring your own towels. 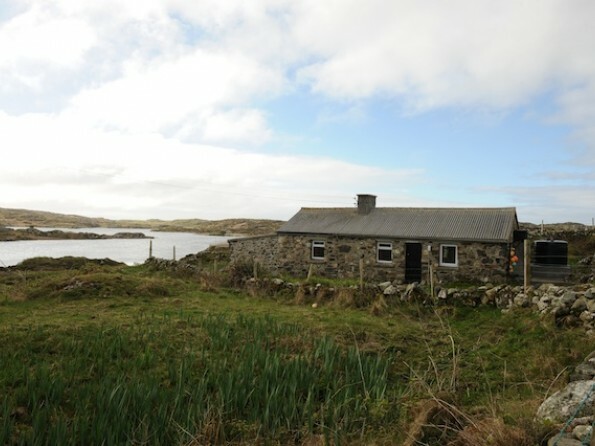 The cottage has its own water supply from a nearby lake, and mains drinking water is available from Ballyconneely (approximately 3 miles away). Bottled water is also available in the store. Unfortunately we are unable to accept credit cards. Dogs are only allowed by prior agreement.